I like to consider myself a fairly smart person and pretty safe person too. No crazy reckless driving, no jumping out of planes, heck I don't even run the risk of over indulging as I don't drink. But apparently there is something out there far more dangerous than I ever suspected. Something that looks harmless, even seems like something a child could use. So what is this sneakily dangerous thing? Apparently if you miss the pizza you are trying to cut up for your toddler and get your thumb instead it will cut right through your fingernail. It surprisingly hurts quite a bit, always needing to be bandaged so the whole thing doesn't rip off-- and yea never realized how much I use my thumb until now. So, when you are teaching your kids about things like strangers and looking before crossing the street- make sure you don't forget the ever dangerous plastic knife. P.S. I know I said I was going to wait a week for Ten Things to Smile About but I am going to do it tomorrow! I will leave the link open for a week and a half so you can wait until next week if you want. So spread the word Ten Things to Smile About will be tomorrow!! That blasted plastic knife!! I've done that with a real knife, but never a plastic one. Ouch! Ouch!! That looks painful! Who knew a plastic knife could be so dangerous? Ouch... I have a nail that is cut down a little bit lower than yours and thankfully my nail tech was able to put a silk wrap on it and now I don't have to baby it! I seriously used my hand as little as possible for two or three days just so I wouldn't rip it off! Plastic knife... yea, they're pretty sharp! Just ask my daughter who cut her self with one (on accident of course). Butter knives are also a dangerous weapon. Keith cousin was in jail for attempted murder for threatening her husband with one. Yeah, ever since Todd's accident, I have the heebie geebies about getting cut. Even with a plastic knife . . .yikes! OUCH! Dang that looks painful! When did you do it? That just makes me shudder--I hate those nail cuts and tears. Hope it grows out soon. Oh my! I would have had no idea...but I am known for cutting myself all the time! Okay, that DOES look really painful!!! Hahaha, I know I shouldn't laugh but you are so cute!! I know how that feels...never actually cut myself with a plastic knife, but my nails tear that low all the time and boy it hurts!!! 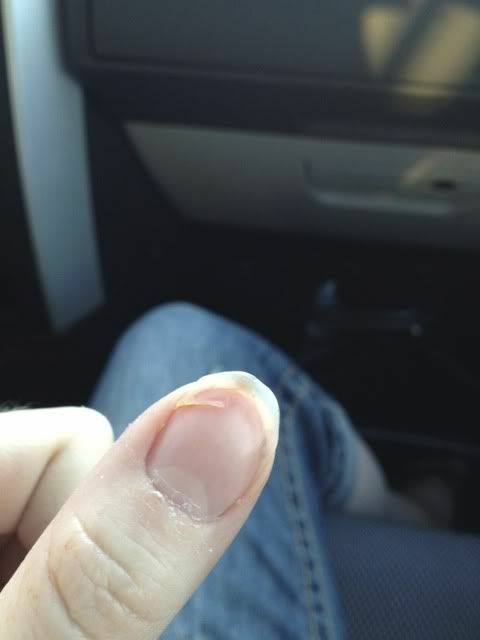 You might have better luck cutting of that loose corner of yoru nail...it will make your nail uneven, but it will hurt a whole let less until it grows out. You really have been around me too long, because this is something I would do! haha. Hope it feels better soon. Ouch! That sounds like something I would do. I have one fingernail that I seem to hurt all the time, and it's so annoying! oh yeah, the naughty plastic knife. She'll get ya every time! Oh no! Fingers/thumbs....very sensitive and we use them nonstop....what a drag. Hope it heals quickly. I can't believe a plastic knife could do that much damage! Man. Ouch! I never would have imagined that a plastic knife would do that.